Once again, we have completed our annual housing bubble check-in. Assessing the criteria that 73 industry executives identified in 2013, we found three qualitative signs of a bubble, two signs of a mini-bubble, and five signs of no bubble. Click here to see our infographic Top 10 Signs of a Market Bubble. Every month, we analyze the quantitative stats in our analysis of 70+ MSAs for our research subscription members. We have concluded that affordability in some markets is the only sign of a bubble that we can find. Reality TV. 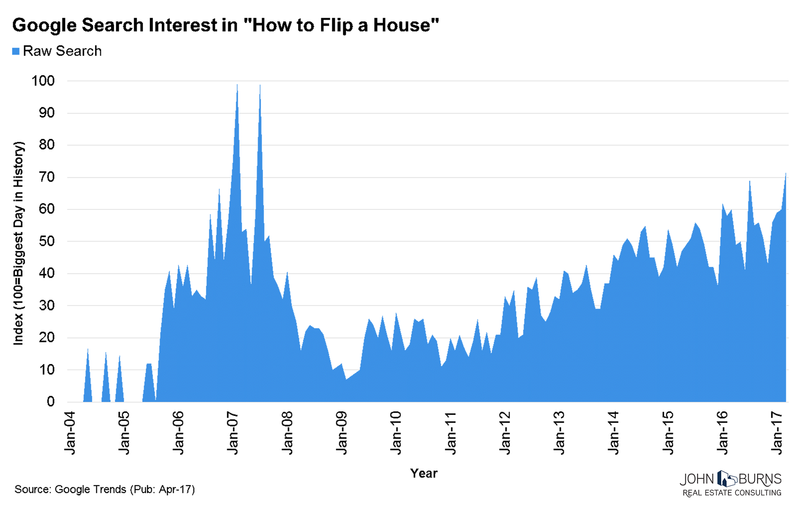 While home builders aren’t giving away free houses every Sunday night like they were on Extreme Home Makeover (ABC) in 2005, shows like Flip or Flop (HGTV), Home Free (Fox), and Deed (CNBC) have been captivating audiences recently. House flipping has become a big business fueled by hard money loans made by non-banks, and Flip or Flop just announced its expansion to five new cities. Booming real estate careers. 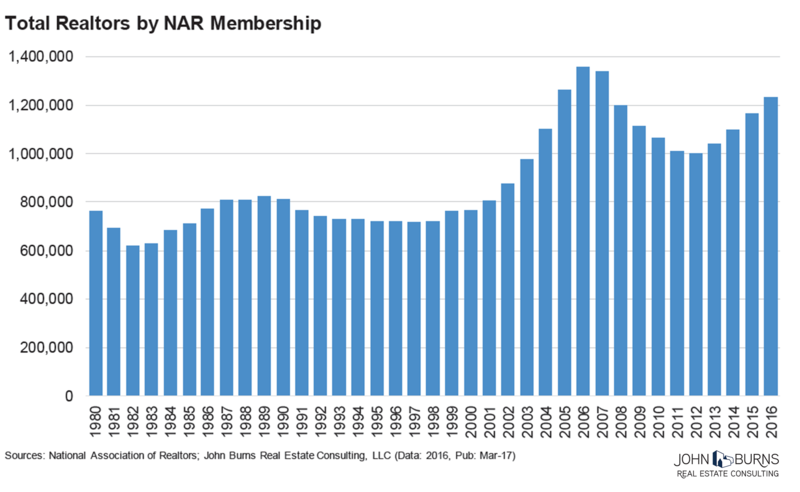 NAR membership has rebounded strongly, pushing near-2005 levels despite far fewer transactions than in 2005. On a recent flight to the hot Portland housing market, one of our team members overheard the flight attendants discussing getting their real estate license. See the chart below. Creative mortgages. Headlines around excessive mortgage documentation and fewer loans to low-credit borrowers mask what is really going on in the market. 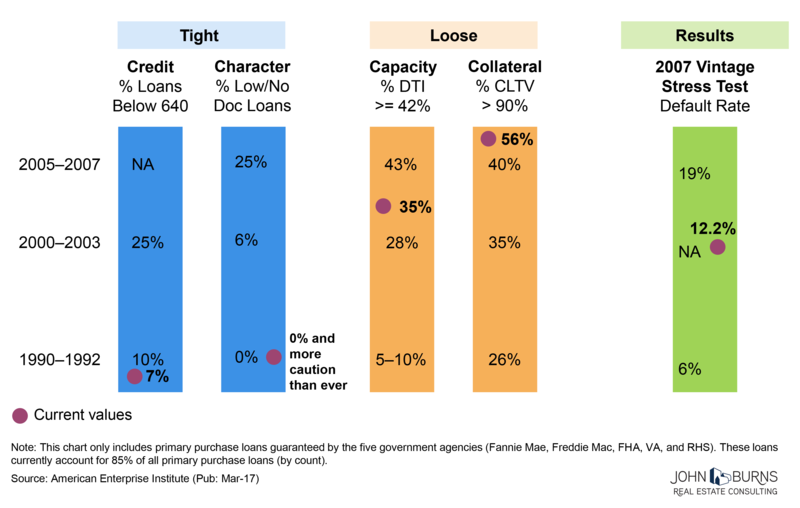 Per AEI, 56% of borrowers put down 10% or less of the purchase price, and 35% have debt service above 42% of their gross income. Lending is clearly not as aggressive as in the 2005–2007 period, which resulted in a 19% default rate. But it is far more aggressive than in the early 1990s, which would have had only a 6% default rate during the last downturn. Today’s loans would have a 12.2% default rate under the 2007 downturn scenario. Outlandish parties. While far more muted than in 2005, we recently met one builder who took their top outside sales agents to Australia and another who is taking the entire company to Hawaii. These trips seem to be rewards for working hard in a tough market rather than the builder having exuberant profits, but we are not aware of any similar trips in recent years. The new urban paradigm shift. 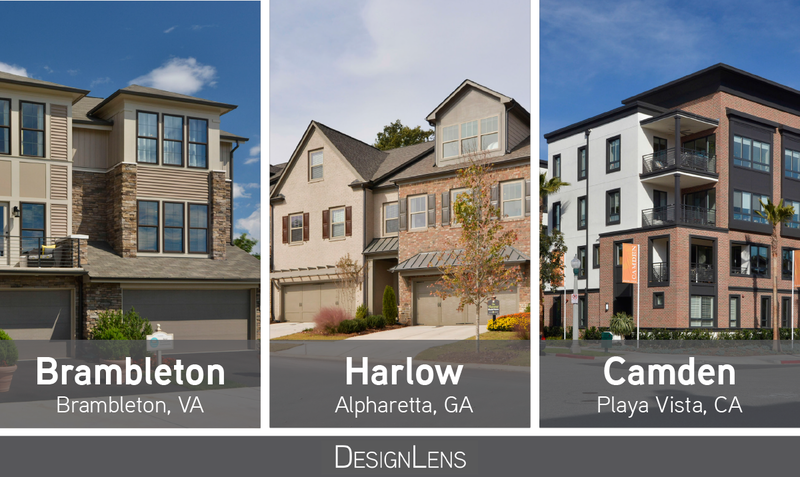 We coined the term surban™ for what we believe will be a continuing trend to build higher-density homes closer to activities and in good school districts. We caution that builders should underwrite these projects with higher-than-usual profit margins due to their additional risk. The up-front capital investment on these projects is typically larger, and buyers of attached homes tend have less urgency to buy when the market slows. Multiple homes for everyone. We haven’t run into lower-paid service workers who own multiple homes, primarily thanks to tight mortgage regulations. Keep an eye on non-regulated lenders getting into this space, however. Truck stop feasibility. While the outlying areas are coming back, particularly in Northern California and Dallas, the most-tertiary markets in most areas have yet to recover. Luxury cars for the staff. Home builder and real estate agent sales and profits have been modest for most of the recovery, keeping big bonus and commission payments down. Lazy underwriting. While the winning bidder on land usually needs to have more optimism than most think is reasonable, underwriting assumptions appear disciplined to us. Excessive investments. The industry has shown amazing discipline, making calculated short-term bets and taking little long-term risk. You can read our 2016 bubble assessment by clicking here. In summary, we remain vigilant in our quest to learn new information that could cause home demand and home prices to swing sharply up or down. As of today, we see only a few signs that our clients have identified to be indicators of a housing bubble. If you can think of any additional signs or see any black swans out there, please let us know.